Gigabyte’s Aivia Osmium gaming keyboard is a very slick looking and attractive peripheral to have displayed as part of your entertainment setup. But is it worth it? Rapoo introduces a new Bluetooth keyboard (with real tactile keys) for iPad and iPhone. Read on to see how it performs. The Corsair Vengeance K90 provides not only unprecedented response in keyboard control, but adds a feature rich bank of dedicated macro and multimedia keys. 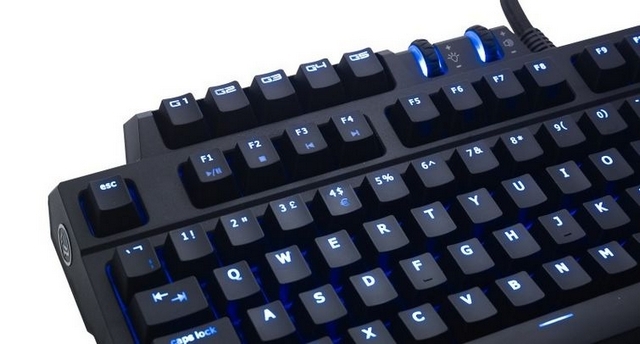 The Razer Blackwidow Ultimate Stealth Edition mechanical keyboard fights against the Thermaltake Meka G1. Check out how it performs against it’s competition. Rosewill RK-V1TP is a slim keyboard with multi-finger trackpad designing for HTPC and multimedia center. It features wireless connection and 10 special multi-media buttons for Windows Vista Media Center.